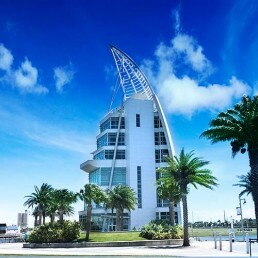 Port Canaveral is located on the east coast of sunny central Florida. The surrounding area offers many exciting attractions, dining options and entertainment. With more recreational opportunities than all of Florida’s 13 other seaports combined, you’re sure to find something you love. The Port itself features three public parks for beaches, marinas, fishing piers, bike trails, campgrounds, and much more. Grab a bite at one of the area’s many restaurants and lounges, where you’ll find everything from quick snacks to full-course meals. Waterfront dining is really a treat, and seafood is always the specialty. When the sun goes down, be sure to hit The Cove at Port Canaveral, a waterfront destination for locals and tourists to enjoy a variety of restaurants, charter boats, shops and live entertainment. Take a seat at one of the outdoor tables at the many tiki bars and enjoy the cool ocean breeze, or dance the night away to DJs, live bands and karaoke. Nearby in Brevard County, Florida’s Space Coast comes alive. Check out the Kennedy Space Center, soak up some rays at Cocoa Beach, or paint the town at one of the area’s many nightclubs. From shopping and museums to a wildlife preserve and airboat rides, there’s plenty to see and do.